The 777X is one of the most advanced long-haul aircraft ever to be designed. The good news is, improvements in air travel are coming to the cabin as well. 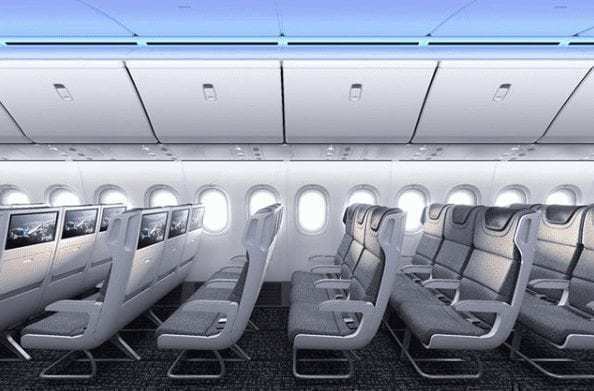 Boeing has revealed some great new pictures of the potential cabin! Boeing is promising an “enhanced passenger experienced” on their largest twin-engine aircraft. We all know that feeling when there’s just no easy access for the perfectly sized carry-on we brought onboard. 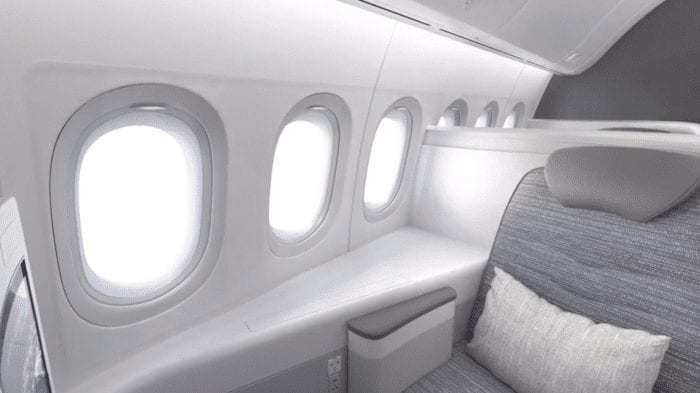 Boeing has promised easy access, but still giving the cabin a unique appearance. The size looks incredible too! Airlines will still probably police the size of carry-ons. Nevertheless, not having to hunt for our carry-ons on the other side of the plane makes for a great journey. It seems like the bins will also be able to handle extra weight in comparison to current bins. That will be an added bonus since a heavy bin can be quite difficult to close. 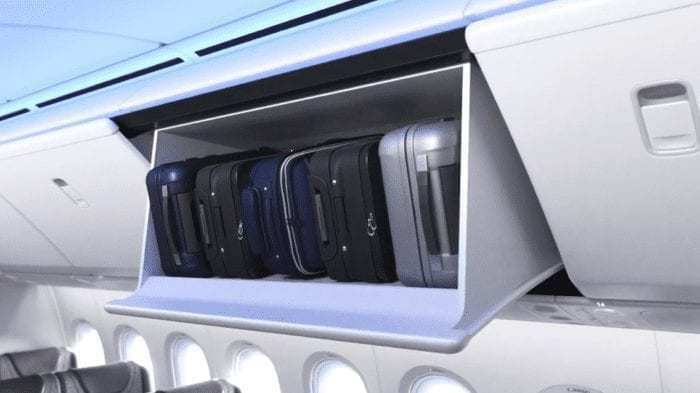 If you’re in first or business class, you could perhaps score one of these large bins for just yourself! Based on new images of the cabin, it seems like Boeing is retaining some passenger favorites from their 787. The ceilings look wonderful and give the aircraft an open-concept feel. Looking at the picture, this seems like a high-density business class in a 2-3-2 layout. Though not incredibly popular with passengers, some airlines tend to make these kinds of configurations work. We just hope they can provide direct aisle access to all business class passengers. Being totally realistic, this looks like a mock-up for a first class seat on an airline like Lufthansa. Boeing seems to be marketing this aircraft as a three-class configuration. Three windows is a lot of pitch which is what seems to give this a first-class feel. Yet, it is entirely possible some airlines may choose to turn this into a business class. We’ve seen some pretty outstanding products in business class! It’ll be interesting to see what new innovations come on this aircraft in the premium cabin. Economy doesn’t seem to look that bad. Economy doesn’t look that bad….if it was 3-3-3. It is quite possible that most airlines will chose a 3-4-3 configuration in economy. The seat pitch looks to be pretty standard at 32 or 33 inches. Interestingly enough, Boeing didn’t release any images of a premium economy cabin! 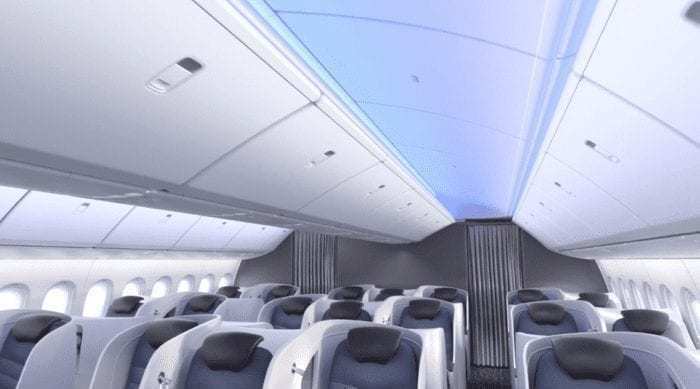 With premium economy being a huge selling point for many airlines, it remains to be seen if any new investments come into that cabin on the 777X. Perhaps wider seats with more pitch? Overall, the 777X looks to be a comfortable aircraft that will enhance the passenger experience. Now we just have to see what new products we’ll find on the 777X! Are you looking forward to flying on the 777X? Let us know in the comments below! 1.THEY SHOULD BUILD THE BOEING 777X Air Linner Jet Plane production immeadly as soon as possible too. Do you agree? Having flown emirates business fr the last 7 yrs I itching to try premium class on SQ. Hope thy buy the 777X inside looks good.